Among several instant classics, ROME’s 2016 release “The Hyperion Machine” included a duet with legendary Swedish singer-songwriter, punk rock godfather and all-around musical genius JOAKIM Thåström. This EP not only features that particularly sombre ballad, but also the initial recording of “Stillwell” that served as the basis for what was eventually to become the sonic meeting of two like-minded troubadours. 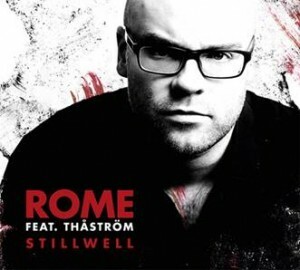 On the album version JOAKIM Thåström and JEROME REUTER added beats, percussion and strings into the song, as well as some additional lyrics in Swedish. Also featured on this release is the intimate version of “Skirmishes for Diotima”, which shows the song in its original form, before the full drum kit became an essential part of the more rock’n’roll live set-up of the band from 2014 to early 2017. Another gem is the indie rock mélange of two early ROME tracks: “Beasts and Birds of Prey”: A journey back to the earlier days of ROME.